From its locally quarried stone foundation to its zinc-coated copper roof, the cottage was inspired by its surroundings. “We talked a lot with our client about what the materiality would be,” says architect Karen Stonely, who, citing the organic style of Bar Harbor architect Robert Patterson, designed the structure with wood rather than drywall. Throughout the cabin, custom built-ins, like a folding table by Bar Harbor woodworker Rick Bradbury, pack maximum utility into a streamlined package. Douglas fir-framed windows by Dynamic Architectural Windows & Doors offer layered indoor-outdoor views. The coffee table is from Baxter & Liebchen and the custom felt rug is by Karkula; built-in daybeds by woodworker Rick Bradbury feature cushions by Chelsea Workroom upholstered in vintage Maharam fabric and leather. In Bar Harbor, Maine, on a secluded waterfront property once used by Brooke Astor as a summer hunting ground, sits an eclectic little garden of collected curiosities: a fragment of a French-style chapel, a Chinese teahouse, a meteorite. 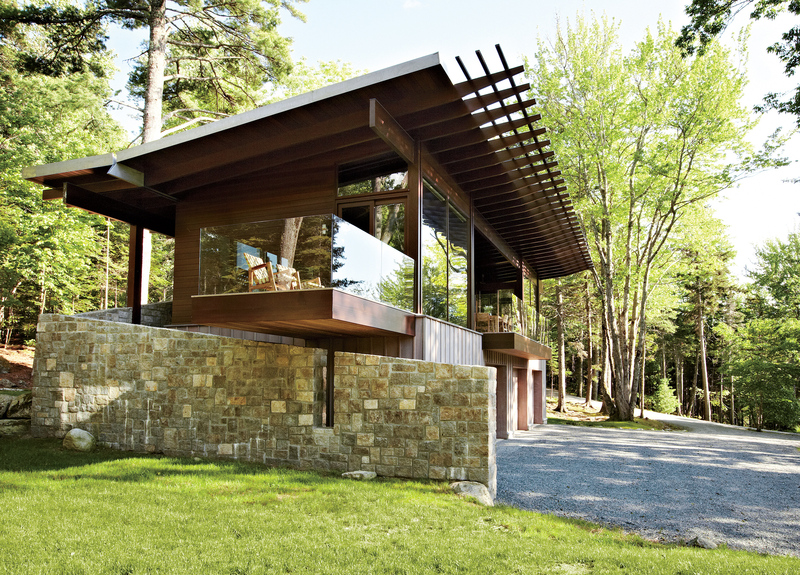 At the center of it all, blending right into the landscape, is a 2,500-square-foot wood-and-stone cabin, designed by New York’s SPAN Architecture principals Karen Stonely and Peter Pelsinski. Nestled into a fern-covered hillside, the modest structure looks to the traditions of John Calvin Stevens, local architect Robert Patterson, and a modernism steeped in vernacular architecture rather than the International Style. “We took a really strong cue from that influence and from the landscape,” says Stonely. The most arresting feature of the house results from its siting. Stepped back from the shoreline, the structure is first approached from nearly 200 feet above, where visitors are greeted by views of the roof’s zinc-coated copper eaves, jutting from the simple rectangular form like branches in the forest around it. But even this moment of drama doesn’t shout; the muted metallic finish recalls the moss around the house, while the structure’s base of locally quarried stone makes the second-floor living quarters appear to float. “For us, this was all about reconnecting to the landscape,” says Pelsinski. “We played these games, like Edward Hopper, where you look through one room then outside to look back inside again, so there’s this layering of interior and exterior spaces.” Facilitating these indoor-outdoor sight lines are floor-to-ceiling windows in triple-stained fir, from Dynamic; wood walls stained to match carry the natural materiality throughout the house. A decade earlier, SPAN designed the client’s Manhattan apartment and discovered his love of dark wood and Arts and Crafts–style detailing. For this project, his vacation home, they combined these aesthetic interests with a utilitarian inspiration: National Park Service campsites, where the client vacationed as a child. Accordingly, the building’s design was stripped to the bare essentials. Two bedrooms frame an open living-dining area, where a pair of built-in daybeds for guests flank a stone fireplace. A dining table folds into the wall when not in use, and, in the master bedroom, a custom felt headboard with hand-stitched details provides storage for camp essentials, including a book, flashlight, and bug spray.